5th Annual TATA Benefit Ride for Care to Share Support Group of Bourbon County KS. All proceeds to Care to Share/The Sharing Bucket Cancer Support Group. 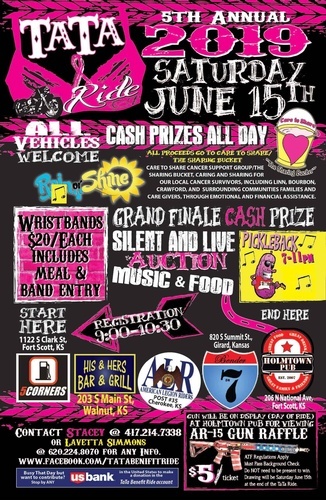 Cash prizes all day, 50/50 Raffle, Grand Finale cash prize, silent & live auction, food, live music from "Pickleback", PMP AR-15 Gun Raffle (gun on display at Holmtown Pub after the ride) - LOTS OF FUN!! All vehicles are welcome. 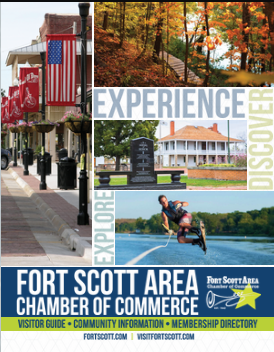 Route begins at 5 Corners Mini Mart in Fort Scott, to His & Hers Bar & Grill in Walnut, to Cherokee American Legion in Cherokee, to Bender on 7 in Girard, and ends at Holmtown Pub in Fort Scott. Saturday, June 15th, all day. Registration begins at 5 Corners from 9-10:30 a.m.
Wristbands $20 each - includes meal & band entry. Raffle tickets $5 each.